Don’t spend months and thousands of dollars developing marketing collateral from scratch. Download and customize our professional marketing materials with your company’s brand. 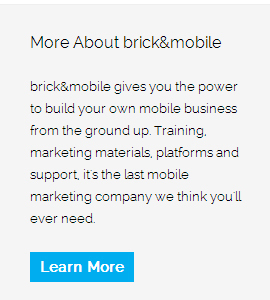 Our mobile marketing professionals who will educate you with essential sales techniques and strategies. Get access to private sales training webinars to help train you and your sales team. Use our business cards, brochures, presentations, checklists, presentations, proposals, graphics and tools to hit the ground running. Simply “find and replace”, and away you go! Save thousands in design fees and weeks of your time by using our professionally designed desktop and mobile websites. Easily edita and custom brand with your own logo and content. Professionally written email lead generating templates to help you farm out more leads and prospects. Use our templates to sell directly to clients or to train your Sales team. Get exclusive access to inner-circle training. All of our partners are invited to our Mobile Community and private Facebook group for strategic discussions and brainstorms.